Estate sale season is pretty hot and heavy around here this fall. If you’ve never been to a sale before, you really should try one out. They can be quite addictive. No, not every single one is a hit, but you can usually scope out what is for sale before you ever get in your car. Most estate sale companies nowadays either advertise on Craigslist, have their own website or will email you when they have sales coming up. Then you can sit at home in your pj’s and check out the online photos first and see if there’s anything that floats your boat. ‘Cause this is pretty darn perty, right? 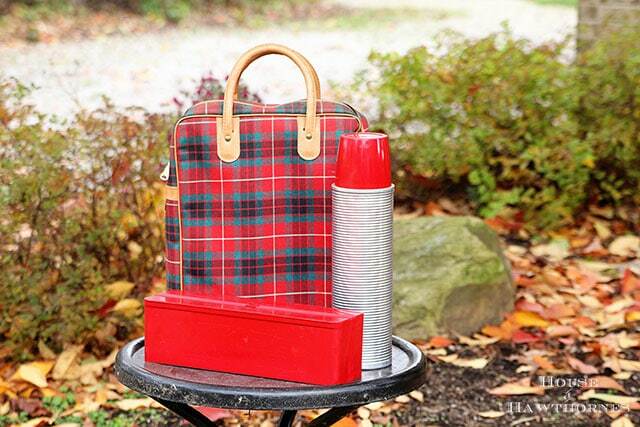 I found this vintage red plaid Thermos brand stadium set (or is it a picnic set?) in the basement of a house. Hidden away underneath a table. Just waiting for me to find him! And it came with the thermos and sandwich box. Score!!! Does this not just shout “Hey, let’s go to a football game!”. I know, I know. You’re probably sick of thermoses, lunchboxes and picnic baskets, but I’m sort of addicted to them right now. Plus the thrifting Gods are just throwing them in my face. Everywhere I go I’m seeing cool ones! 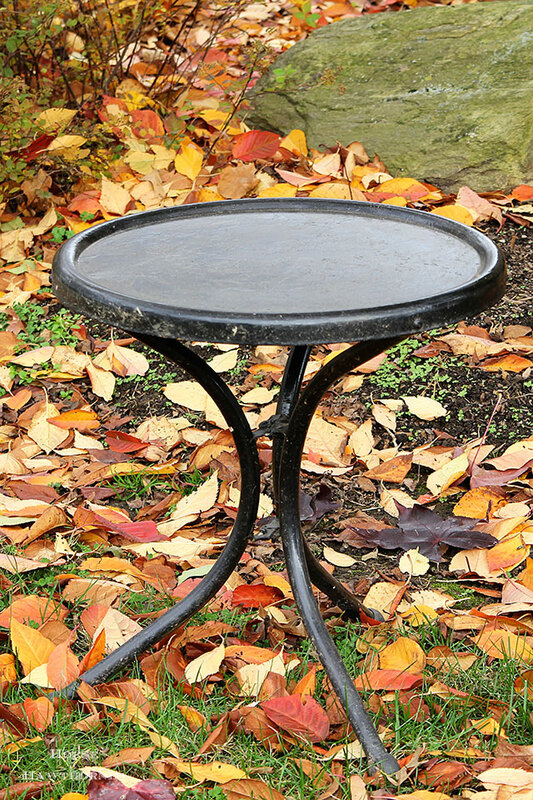 At the same sale, I found this black metal side table that will look awesome with my motel chair I painted a few months ago. Just picture it with a cold glass of lemonade and a bottle of sunscreen setting on it next summer. I have been seeing these vintage 1954 (redundant?) 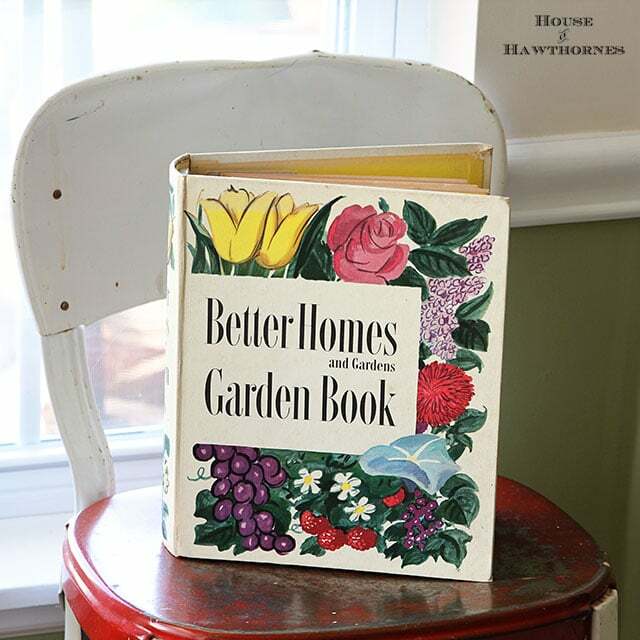 Better Home And Gardens Garden Book books (super redundant?) at various estate sales and thrift stores recently, but they’re always in crummy shape. Crummy shape isn’t normally a deterrent for me, but a book in crummy shape just means its grimy and gross and I probably wouldn’t want to thumb through it myself without a big old bottle of Purell next to me. So I was super excited to see this one at an estate sale and in pretty much perfect condition! No Purell required! It has such great photos and graphics in it! 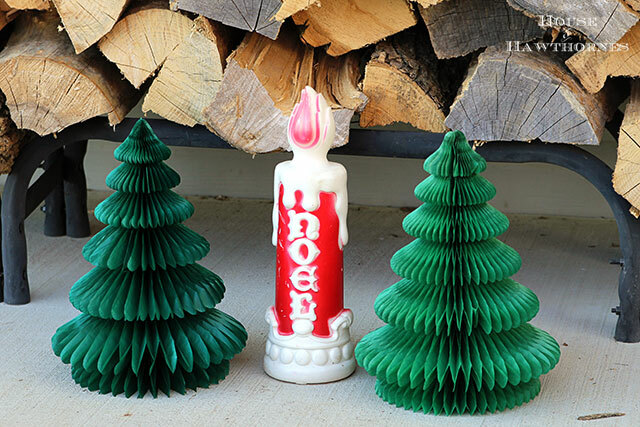 I scored a non-vintage NOEL candle blow mold (a UL sticker was a dead giveaway that it is not very old) and two honeycomb tissue paper Christmas trees too. I got to this sale an hour or so after it started and missed 99.9% of the vintage Christmas stuff I had seen in the ad though. The moral of the story is that if you snooze you lose. And I’m not even talking figuratively. If you sleep in, you will not be one of the first ones in line at an estate sale. Wonder if THAT is where that saying came from in the first place? Have you been to any good sales recently? Do you try to be first in line or do you just go whenever you get out of bed and have had your Starbucks? 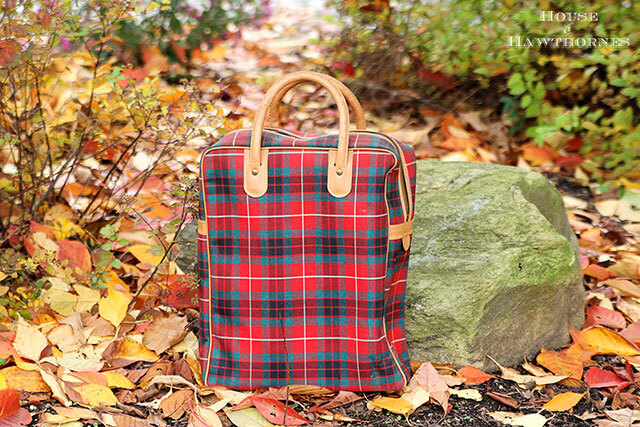 I would have been screaming like a little girl (but all internally, of course) if I had found this plaid bag WITH a thermos and box intact inside!! I would LOVE to find one of these, exactly like this, because, don’t you know, you spoiled me with your thermos’ and different decor with them. I now have 5 thermos in plaid, silver, red/black, red to use in decor in kitchen so I can reproduce your display with santa mug (which I have some Lefton ones) and bottlebrush trees on my kitchen counter! I saw your set ups with the plaid, the thermos, lunch box, etc and I was HOOKED! LOL Your decor vignettes are exactly the kind of vintage that I LOVE and am trying to do in my own home. So, no, I am NOT tired of thermos and bags and plaid!!! Just this morning I was writing an e-mail to a friend telling her that I was in a quandary over going to an estate sale tomorrow morning. It’s going to be freezing cold, but there were art supplies in one of the preview pics online and several other pics featured wonderful things I know I just can’t live without.. It’s a tug of war between a warm bed and sleeping in and getting up early to freeze your buns off for some ultra-cool vintage nic-nacs… and I can almost guarantee you the nic-nacs and art supplies will win…lol! LOVE all of your finds, Pam…especially the honeycomb trees! I just go to sales whenever I get there…I’m not much of a stand-in-lines girl. Not many estate around here now, but I did find vintage Christmas ornaments at the thrift store yesterday! 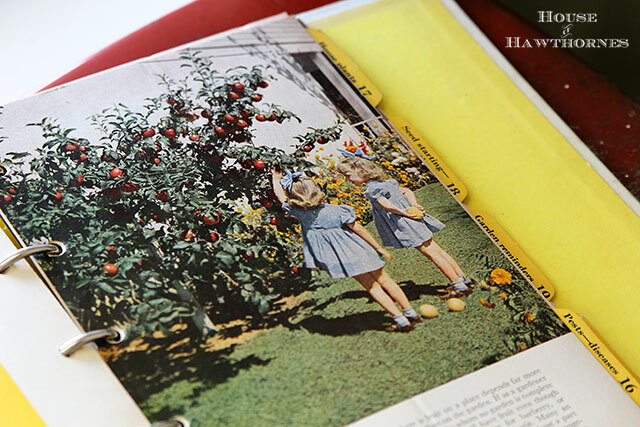 The only thing better about finding a vintage book is finding one with notes, recipes or old newspaper articles tucked between the pages. Love that book and the candle and the picnic set. GREAT finds, for sure. I think the table is perfect too. I can picture that pitcher of lemonade sitting right on it. These days, with four kids to load into the car, I’m more likely to just stay home. Unless there’s something in the ad that gets me really drooling. Otherwise, we’ll hit the sale later in the weekend when stuff is marked down. Hi Pam. I am meeting Sue tomorrow around noon in Canal at Cornersmiths and Polly’s. If you want to join us. You really did Score! That plaid stadium set would look rather cozy at our A-frame. Just saying…in case it comes up missing! Last Thursday, I stood in line before work praying that the Gurley Indian Thanksgiving candles that I had seen the night before were still available. I lucked out. Got 10 different types of Gurley candles for a steal. It was worth the wait. Sales around here are few and far between. The estate sale liquidator, Caring Transitions, is prevalent in my area. They terribly over price their items. For example, I saw a metal trashcan they priced at $4. On the bottom of the can was a Big Lots price tag of $4. In another instance, I saw a covered wicker basket that they priced at $12. The original tag was on the item. They crossed out the price tag with a black Sharpie marker, and we know how well those hide prices!!!. It was $9.99 from Pier One. There are many other instances. I quit going to their sales. I have yet to try another company, as they just don’t come my way very often. There is nothing I NEED, so I just go the second day after noon and take advantage of the “half-price”, which I put in quotes for obvious reasons. I don’t trust them very much. We are sticking to the yard sale and don’t find much good stuff there either. We’ll keep trying on those, though. But, the sales are dwindling as it gets colder. I say a girl cannot have too many thermos, picnic baskets and lunch boxes! So keep buying them Pam! I love seeing them. I think you found some neat stuff. I’ve got a bad case of estate sale envy, Pam!! The few sales that have been held in my area the last few months have been on days that I work, so I’ve had a dry spell myself. You’ve really hit the jackpot with your recent finds! The photos in the book are so darn sweet! Lucky girl. I’ve had one of those books for several years now–terribly handy, and I got it at a local Thrift Store! !